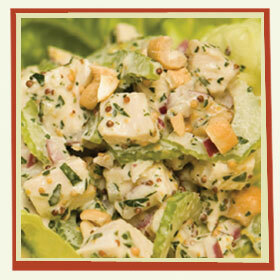 Summer seems to be upon us and what sounds more delicious than a cool, crisp salad? One of the most popular summer herbs is Tarragon and salad recipes with tarragon are endless. 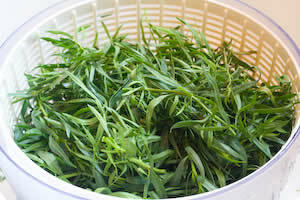 French Tarragon is best started by division of the roots as the true plant does not bloom, thus it has no seeds. The history of tarragon is a bit vague with the Moors taking credit for introducing it to Europe, but the French are the ones who loved and used it most. Naturally tarragon was once used as a love potion! Aside from salads, tarragon is essential in Bearnaise sauce as well as Sauce Tartare. A friend to eggs, chicken, turkey, and lamb, a tarragon herb butter can also enhance the flavor of fish. Heat the oven to 350, truss the chicken, putting the tarragon sprig inside. Soften the butter and beat in the lemon rind and chopped tarragon. Spread butter over chicken, place in roasting pan, cover with foil and roast for 1-1/2 hours — remove foil and add cider and continue to roast 1/2 hour longer. Lift out chicken and let cool. Save juices in bowl and refrigerate to set. When set, skim off fat from surface. Whisk juices and add mayonnaise. Skin, bone, and chop the pieces of chicken. Add to torn lettuce together with cucumber junks and cover with sauce. Garnish salad with either tarragon sprigs or chopped tarragon. I happened across the following not long ago and thought how true -The digestion depends to a large extent upon the palate, the sense of smell, and the enjoyment of food. If food smells good and tastes good, then the saliva in the mouth begins to flow, which helps in the mastication of that food. The enjoyment in eating the food provides a relaxed frame of mind and body and is again helpful to the digestion. A special thanks to Randy Nelson and all the herb growing apprentice chefs. The garden is off to a fine start and we should have a great summer!